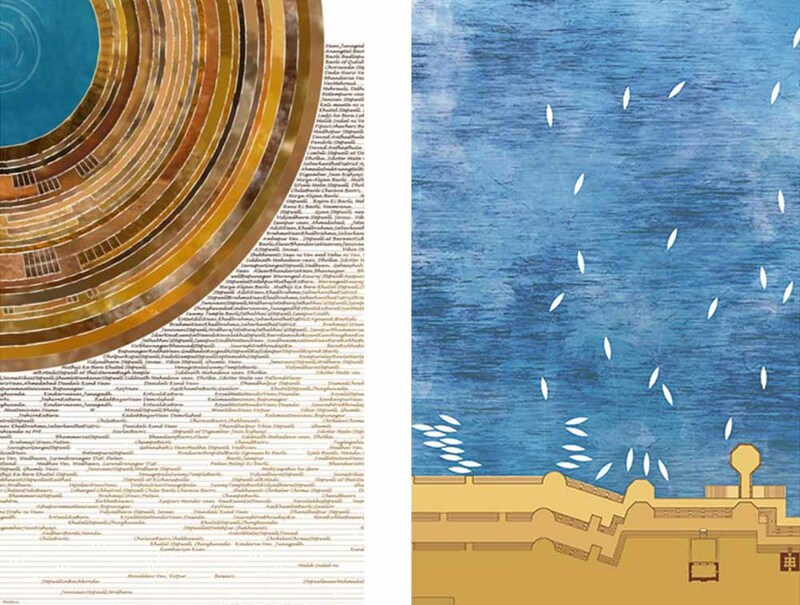 For Ambalal’s latest exhibition, 19 artists like Manu Parekh, Atul Dodiya and BV Doshi each contributed a painted scroll. Ambalal’s 28 own artworks recount anecdotes from his life. The show is on at Archer Art Gallery till December 15. It’s an exhibition like no other, with 19 established Indian artists coming together to gift paintings as tribute to one artist. 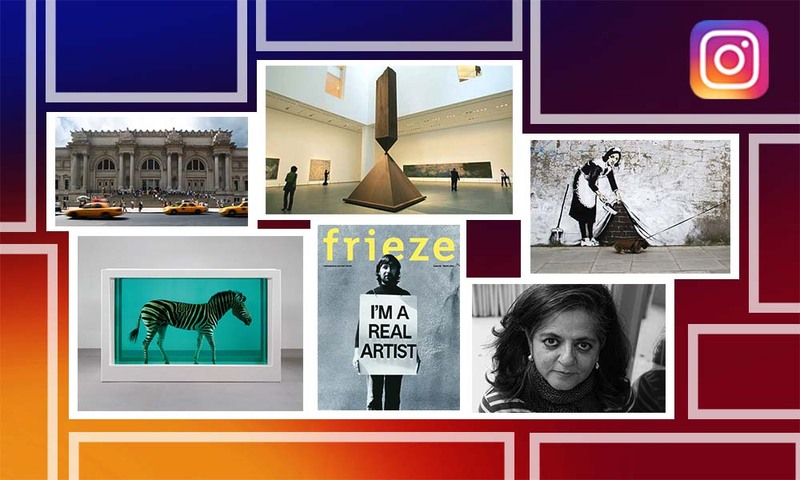 To mark their friend Amit Ambalal’s 75th birthday, artists like Manu and Madhvi Parekh, Anju and Atul Dodiya, Gulam Mohammed and Nilima Sheikh, Anjolie Ela Menon, BV Doshi and Jogen Chowdhury, have all contributed a painted scroll each for his exhibition. 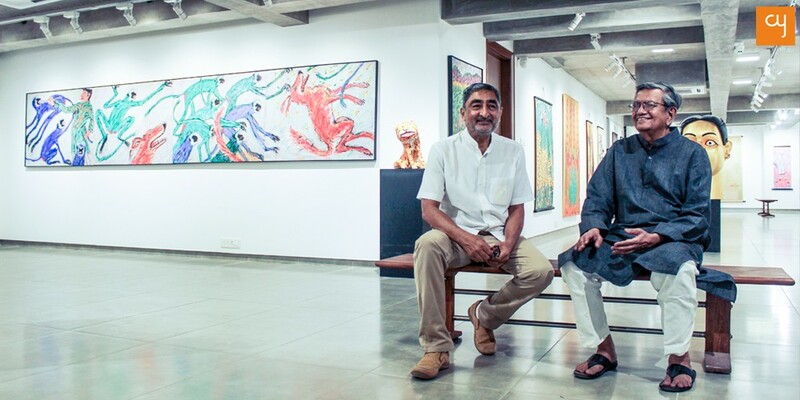 Amit Ambalal himself displays 28 original paintings in the exhibition, all of which celebrate memories from his childhood and recount delightful anecdotes from his life. Observing these jubilant and vivid artworks by Ambalal is like having a multi-gustatory experience. One tastes a different flavour each and every time! His 28 paintings bear motifs of animals and imaginary characters. 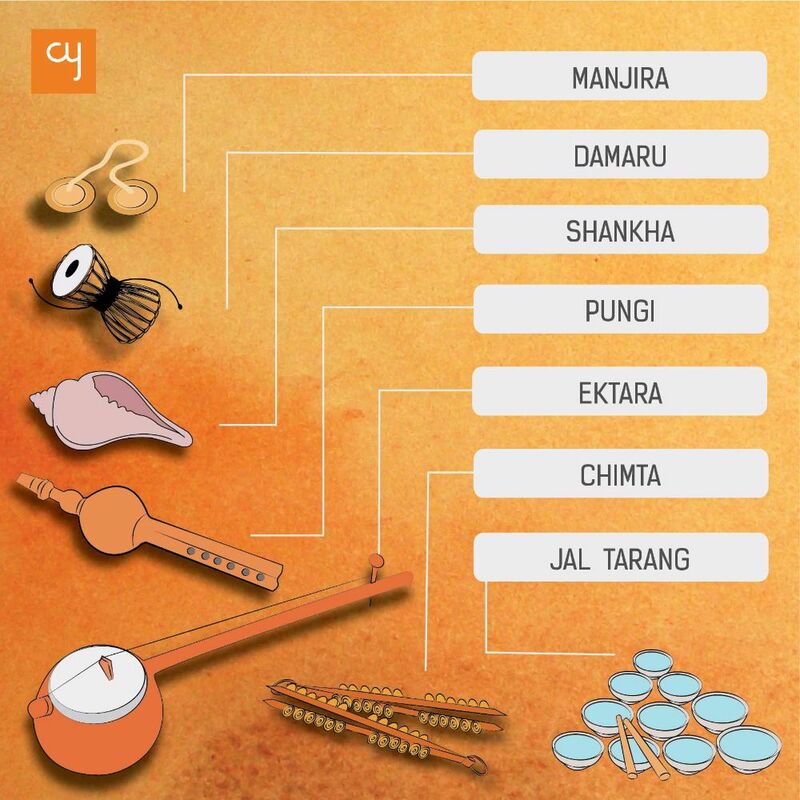 The innocence in Ambalal’s every subject is evident. it’s there in his diptych painting of a group of crows who misunderstand the artist to be a murderer and plan to attack his head. It’s there in his triptych self-portrait in which a group of monkeys tease him and his dog at his studio. According to Ambalal, “a lot of monkeys comes to meet and inspire” him at his studio. The painting of crows has a splendidly chaotic colour combination. While the first half of the artwork depicts fluttering crows in monochrome, its other half combines vigorous colours, and Ambalal is evident as a figure trying to hide in the bushes to save himself. Even on the show’s inaugural day of October 11, a special arrangement was made for Ambalal and his friends to use the birthday cake as a blank canvas on which to paint spontaneously using edible icing! 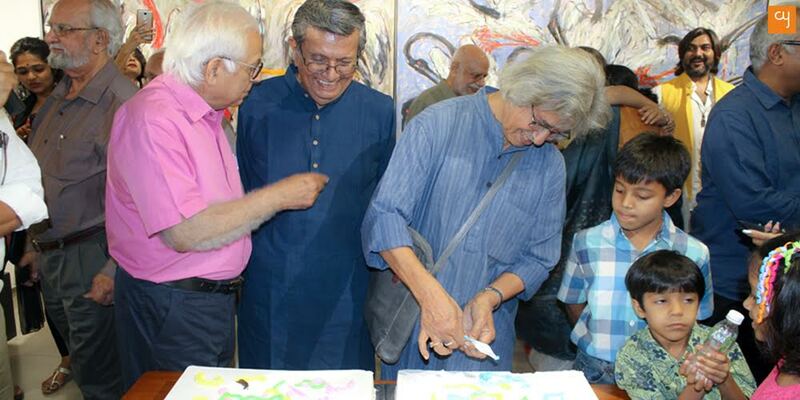 The 75th birthday transformed into a celebratory event when the senior artists started pouring the icing on each other cheerfully, in true child-like exuberance. 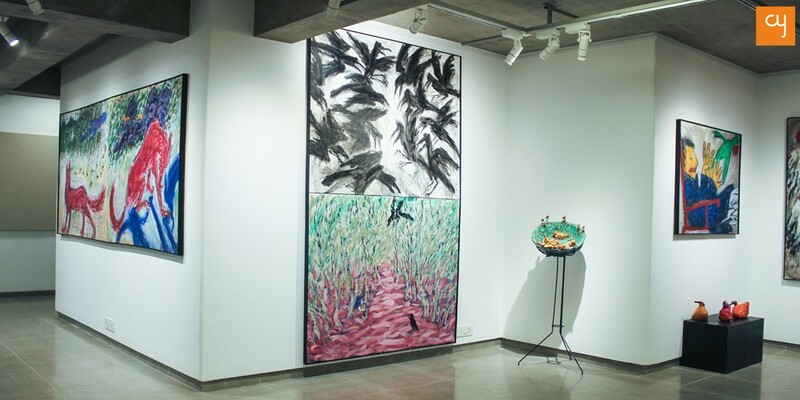 The exhibition also hosts the remarkable bird series of Ambalal. 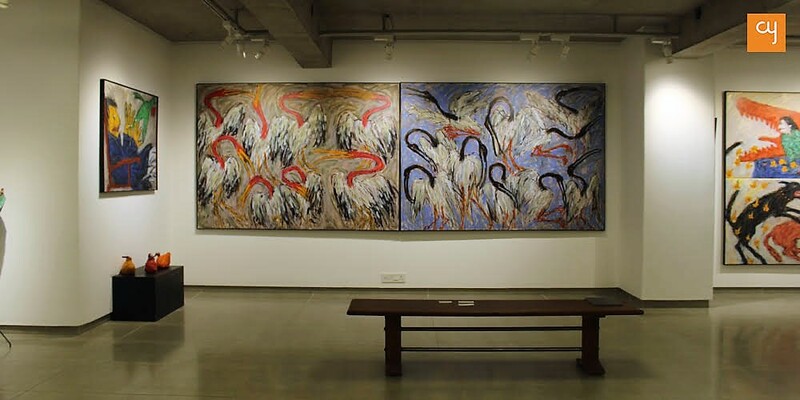 The series’ epitome is a diptych painting of huge egrets. The picture animatedly depicts a pleasing view of multiple black- and red-necked egrets. Ambalal was inspired by egrets during his childhood years spent beside Kankaria Lake, and they’ve now been transformed in his senior years through his mature strokes. The confidence in his strokes may remind you of the circular strokes of Vincent van Gogh. 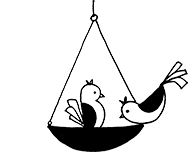 The reminiscences will transport you back to your own intimate childhood experiences. The bright, fresh and vivid colour schemes of Ambalal’s paintings lend a positive and uplifting feeling. Ambalal left his family business at the age of 36 in 1979 to become a full-time artist instead of a Sunday painter. His timing was lucky, in fact, because very soon after he sold off his family mill, the textile mill industry in India began to fall. In an interaction with Creative Yatra earlier Ambalal shared how his father helped him to pursue his dream. He has been practising art since 40 years now and was deeply inspired by his mother, who was a sculptor, and his guru Chhaganlal Jadav. 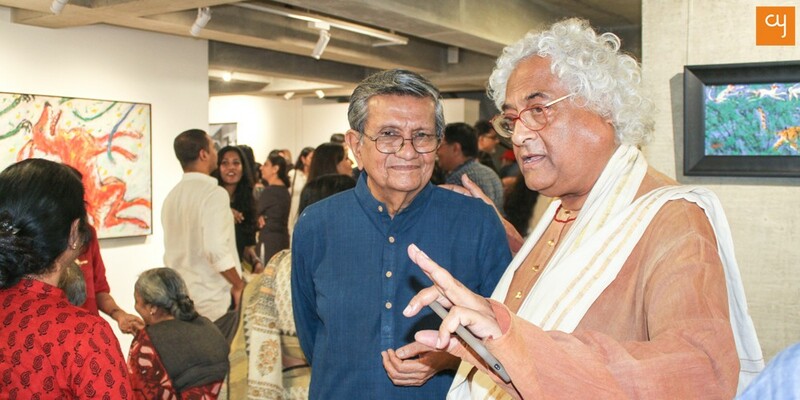 The Ahmedabad-based artist, who is an expert on Rajasthani Pichwai art, has been honoured with the Gaurav Puraskar by Gujarat Lalit Kala Akademi and the Kailas Lalitkala Award for his contributions to the art world. He has also published multiple books, including a special feature on the Pichwai art of Nathdwara, called Krishna as Shrinathji: Rajasthani Paintings from Nathdvara. Contemporary painter Anju Dodiya, who also participated in the exhibition, once referred to Ambalal as an “aesthete” in an interview with us. The 19 friends of Ambalal, veteran artists in their own right, haven’t left a single table unturned to make their friend’s 75th birth anniversary a memorable affair. 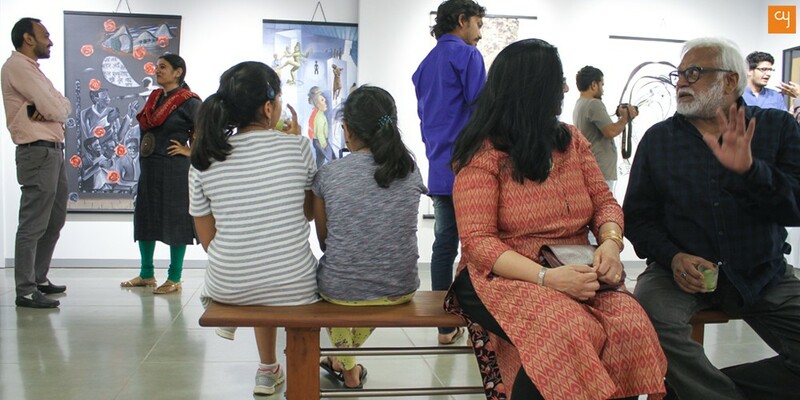 Most of the senior artists were present during the inaugural evening hours alongside the various art lovers, connoisseurs, experts and collectors of Ahmedabad who had come to see the show’s opening. Padma Shri Manu Parekh‘s dark red abstract forms, that carry the impression of his famous Varanasi series, were “a tribute to the ex-mill owner, who is as humble as his artworks.” Padma Bhushan winning artist Achutan Ramachandran Nair of Kerala presented a beautiful artwork of himself as a snail in the midst of nature, surrounded by birds, plants and a woman. Padma Shri Anjolie Ela Menon, who seemed to be relishing every moment of the show as if it were a long-pending reunion with age-old friends, portrayed the innocence of Amit Ambalal in the form of a shepherd girl. This motif of a shepherd girl standing with goats in a sepia background is an extension of her current series. 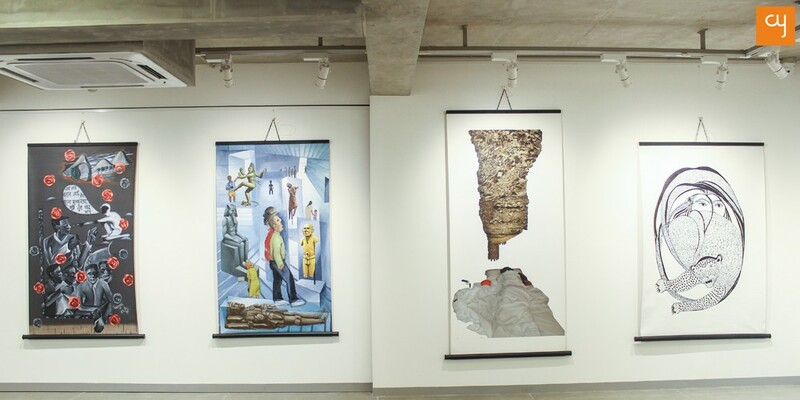 India’s top-selling artist Atul Dodiya remembered a time he spent at Nathdwara with Amit Ambalal and their late artist friend Bhupen Khakhar. He beautifully depicts Nathdwara using dark tones and juxtaposes it with skillfully composed portraits of Ambalal and Khakhar alongside his favourite monkey gods. A quote mentioned in the artwork saying“Jab jab bahar aayi aur phool muskuraye, muje tum yaad aaye”, is not just a song from the film Taqdeer (1967) but also captures a fond memory that the three friends – Dodiya, Ambalal and Khakhar – shared together years back. Modernist figurative painter Arpita Singh has painted a work with a pink background that bears a portrait of Ambalal surrounded by billboard slogans. Ambalal’s senior friend and Pritzker Prize-winning architect BV Doshi also wished well for the artist’s ‘upcoming golden years’ by sketching a place in freehand style. Jogen Chowdhury, a Bengali artist of Shantiniketan, expressed Ambalal’s cheerful attitude through a colourful painting bearing Ambalal’s figure in the centre. He embellished the painting with animals and imaginary creatures and greeted Ambalal with a cake wishing him a ‘Happy 75th Birthday’. This magical show by Amit Ambalal and his vibrant friends will remain open for all until December 15, every day except Sundays from 11:00 am to 07:00 pm at Archer Art Gallery. But this two-month long exhibition will surely not ‘conclude’ once it’s been wrapped up; its power will echo on for a long time and may continue to inspire for generations to come.